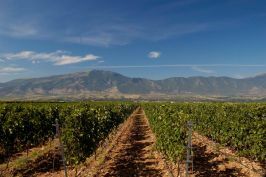 Pavlidis Estate vineyards are situated in two different sites, distinguished from ancient times for their unique terroir, Kokkinogia and Perichora. Grapes of these regions are vinified to produce wines bearing the geographical indication of Regional Wine of Drama. In order to better express the qualities of both variety and site, yields are controlled meticulously and all viticultural practices are conducted manually. In addition to this, pest management is implemented according to the principles of "integrated production" in order to guarantee consumer and environment protection. Modern viticultural practices (like regulated deficit irrigation) and the analyze of several parameters provided by a weather station installed in the vineyards, ensure optimum berry ripening.